Currently UK car buyers seem to be completely captivated by premium hatches such as the Mini, Fiat 500, Audi A1 and Citroen DS3, thanks in part to the thousands of customisation options available. There’s no need nowadays to be driving a car the same as someone else, which certainly holds its appeal. 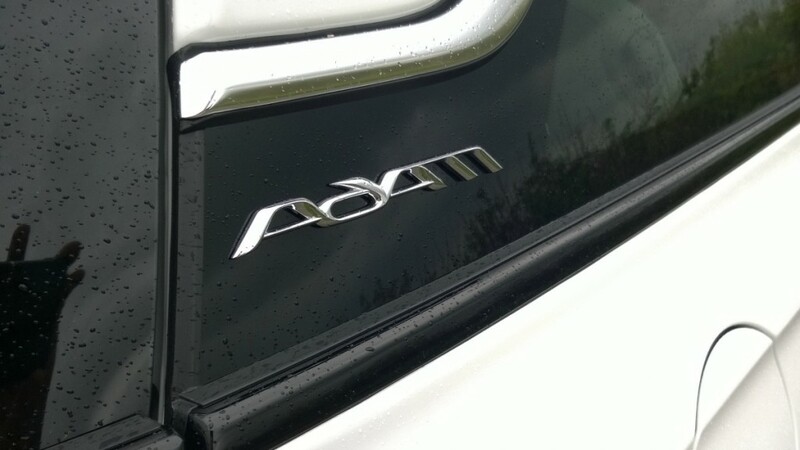 It’s no wonder then that other manufacturers want in on the action, and the latest to join the fray is Vauxhall with the launch of the interestingly named Adam. 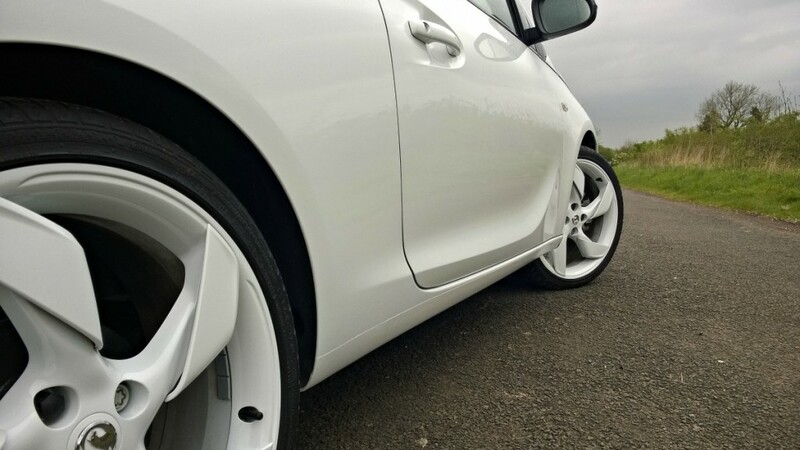 Based on a shortened version of the Corsa platform the Adam is really dinky, but every inch has been stylised to within an inch of its life. Everywhere you look it’s clear designers have paid meticulous attention to how the car looks. The result actually surprised me as I wasn’t a fan, having seen the car in photos. It sits quite low to the road with an imposing nose with an oversized grill and darkened headlights. The floating roof works incredibly well, if a little fussy around the A-pillar where it meets the bonnet shut line. The massive 18 inch wheels give a slightly toy-like appearance but they look good as do the neat creases that sweep from the rear round to the door handle. The rear looks good too with small taillights and secondary round lights in the bumper. Powering my test car is a 1.4 litre 86 bhp petrol engine that although not particularly quick is smooth and punchy when you need it. It’s mated to a slick shifting 5 speed manual that has sensibly space ratios resulting in the 60 mpg sprint taking 12.5 seconds. There’s a pleasant note to the exhaust under acceleration that helps mask the otherwise uninspiring engine note. The driving experience lacks a little of the fizz you get with a Mini or DS3 but there is still plenty of fun to be had. The taut sports chassis brings with it a relatively firm ride giving the Adam a chuckable nature with wide wheels offering plenty of grip. The ride is quite forgiving considering the size of those wheels making long distance jaunts a doddle although the engine can always be heard when tackling faster roads. The only real disappointment is levelled at the steering which is nice and light around town but never really weights up at speed doesn’t offer much in the way of feedback. Inside the youthful design of the exterior continues with a dashboard that’s modern, thoughtfully designed and constructed of plush materials. 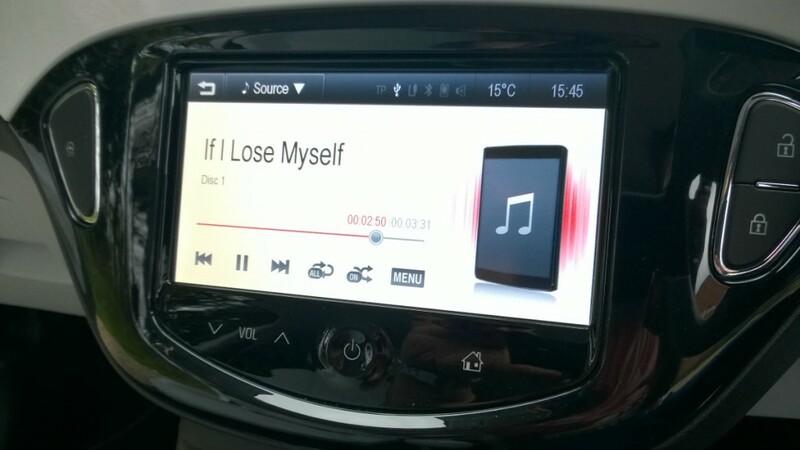 There’s a big slab of body coloured trim stretching the width of the dash with round vents and Vauxhall’s IntelliLink touchscreen infotainment system taking centre stage. 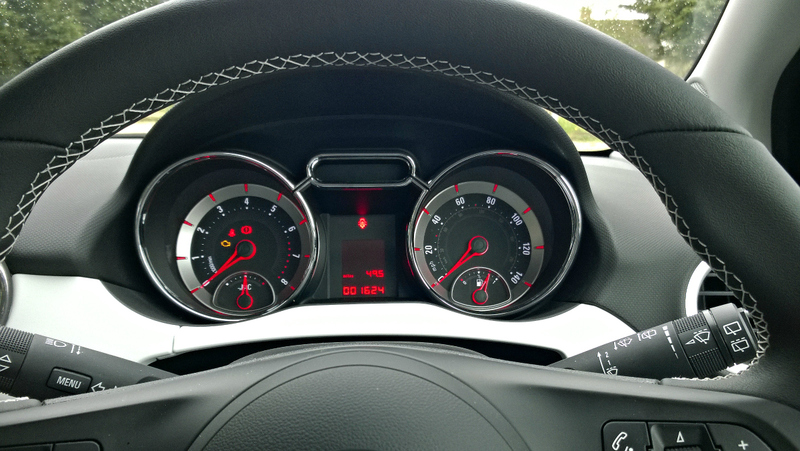 The dials are heavily styled too with black, white and red details making them look really quite special as do the heating controls that illuminate as you turn the dials. Amusingly there are also a couple of shark doodles pressed into the rear door bins although I’m not sure why! The model you see here is the White Edition which is why everything inside from the trim to the seats and headlining are finished in dentist white which although I’m sure will get marked easily creates a bright and fresh cabin. 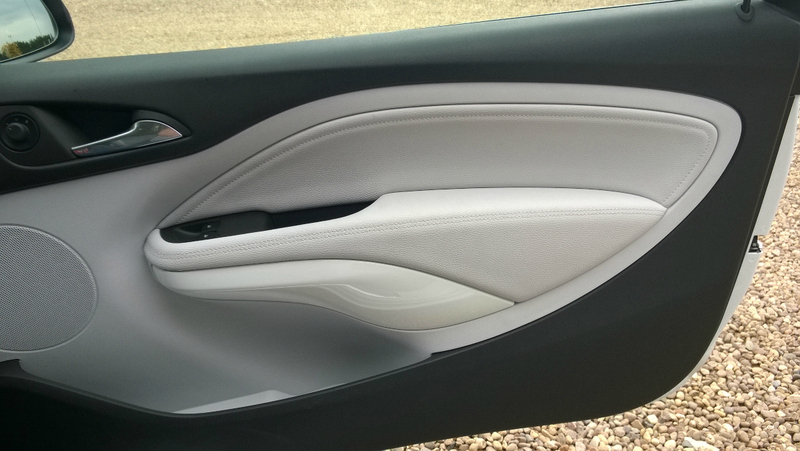 It also hides the fact that the Adam is tight for space in the rear where both leg and headroom are severely restricted for even children. 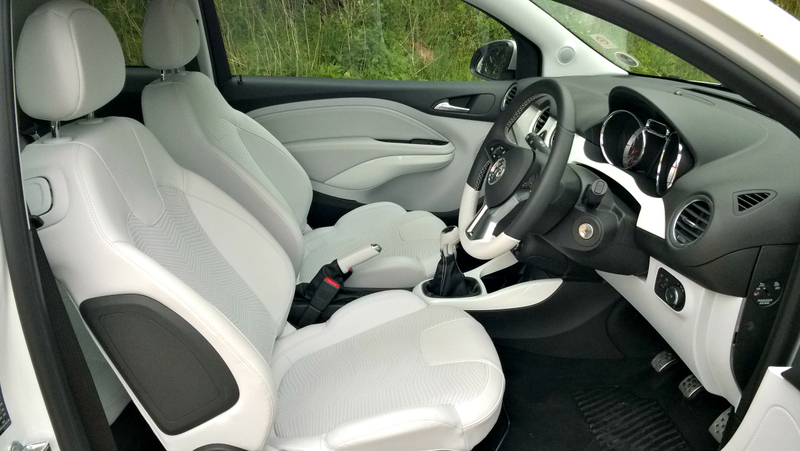 The seats though are very comfortable with good support for longer journeys and plenty of adjustment. 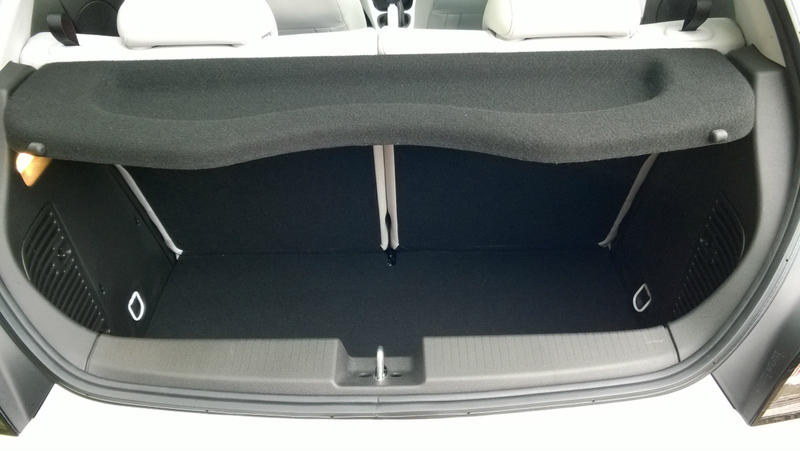 The Adam’s compact dimensions mean that the boot is tiny, but should be able to swallow a couple of weekend bags. 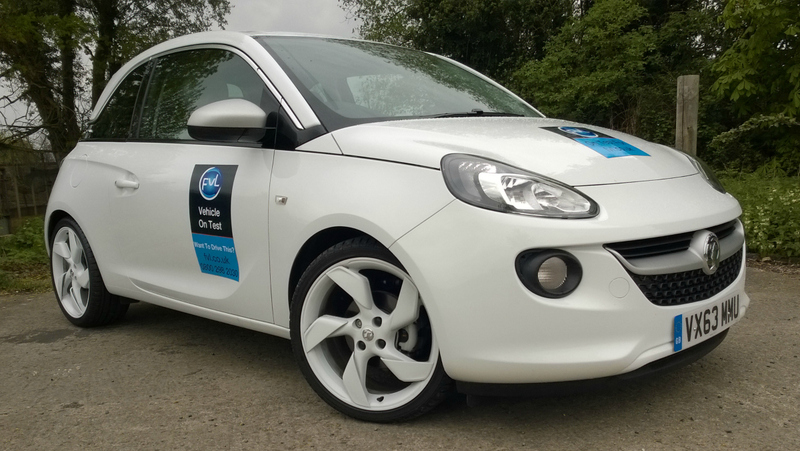 Priced at £14,995 the Adam White Edition is on par with its rivals and comes with enough toys to satisfy most buyers. 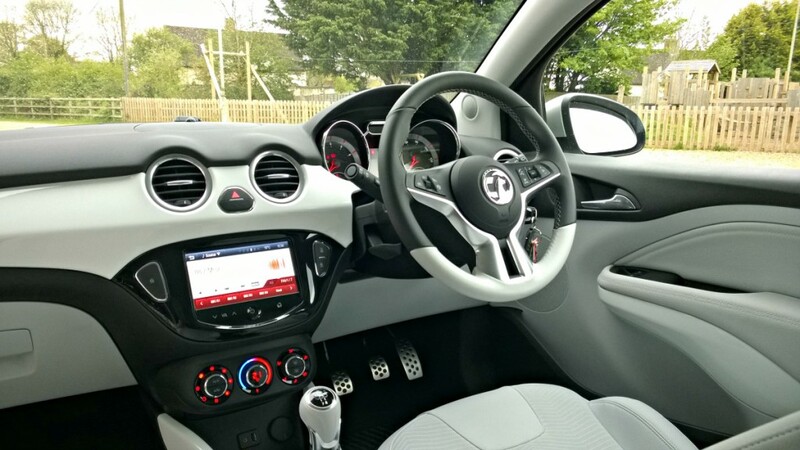 Alloys wheels, a rear spoiler, digital climate control, cruise control, half leather seats and a touch screen infotainment system that can be synced with your phone all come as standard. Then there’s the myriad of customisation options available, to further make your Adam stand out from the crowd. With combined fuel economy of 51.4 mpg which I managed to get pretty close to, running costs are unlikely to break the bank, although emissions a little worse than some rivals falling into VED band D, which equates to £110 per year. If you opt for an ecoFLEX Adam which gets standard fit stop-start technology, the tax band drops to band C which will cost just £30 per year. At time of publication: Adam 1.2I Ecoflex from £126.87 per month plus VAT. 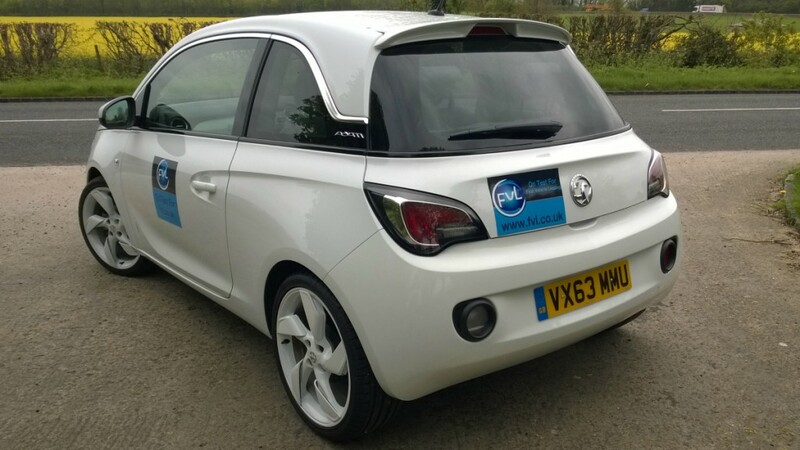 This entry was posted in Car Reviews, New Cars, News and Views, Small Car and tagged on the road, review, vauxhall, vauxhall adam by Rob McSorley. Bookmark the permalink.